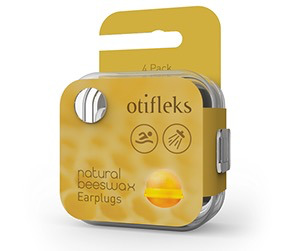 The first earplug to be made out of natural beeswax. Made from a honeycomb and cotton fibre mixture. The mixture’s anti-bacterial properties prevent the spread of germs from your hands or surrounding environment to your ear. The cotton fibre adds solidity, keeping the natural beeswax from disintegrating, splitting or breaking within the ear. 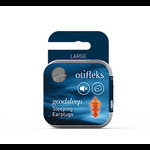 By covering the entrance of the ear only, Otifleks provides quick and easy applicability. Inside you will find a hygienic carry-box for storing your earplugs. The natural beeswax earplugs are packaged in individual plastic spheres. Hygiene is assured. You will be the first person to touch or handle the earplugs. Contains beeswax, olive oil (for pliability) and cotton (for solidity) – can be Sunflower Seed Oil according to seasonal availability. Designed to be sticky to grip onto the skin. Suitable for newborns, children and adults of all ages. Suitable for showering & swimming. May also be used against sound. Ideal for people who do not like to insert something into their ear canal. Pack of 4 moldable earplugs (2 sets). Can be used 5 to 10 times. Packaging doubles as carry container.